If you’re searching for the best sounding acoustic guitar the market has to offer right this moment, this guide will help you figure out what you need and how to get it. We’ve gathered it together, piece by piece, by going through honest reviews, opinions from music experts and amateurs, so you can find sound advice and buying options that you can follow. One model that stood out is the Seagull S6 Original. It is a piece created with attention to detail from elegant materials, and the sound it generates is loud, clear, and warm. As an alternative, we recommend you the Yamaha A-Series A3M if the first one is out of stock. Down in the list below, you have what could be among the best sounding affordable acoustic guitar models for you and your needs. All the alternatives featured in this article have been expertly picked from a sea of products due to their craft quality, their price, and because both experienced players and beginners can use them without a loss in sound quality. This piece combines the domestic wild cherry back and sides with a unique tone that will make a long-lasting impression on you. Blending the sensual warmth of mahogany with the slightly crisp definition of maple, the guitar will allow you to take your creativity to new heights. It features a Silverleaf maple neck on a more reduced 24.84″ scale, and a Rosewood fretboard that is easy on the fingers. Plus, the manufacturer improved its design so it can be more quickly adjusted to tune while you’re in a hurry. Its semi-gloss lacquer finish gives it elegance and prolongs its lifespan. It is made in the USA, meaning you have a guarantee that what you’ll receive respects all the industry’s standards. Additionally, its slightly wider nut is much easier to fret, which will allow for enhances speeds. It is comfortable to play for many hours in a row, and you can use any type of strings with it. Designed to be the guitar you need for all your creative endeavors, the Yamaha piece is crafted with small details that make it ideal while on the go. With its natural, dynamic plugged-in tonality and simplicity, this cheap alternative will become your primary tool in no time. The hand-rolled fingerboard edges on a straight taper neck allow it to be comfortable in any playing position, and the custom designed scalloped bracing pattern helps generate an expressive acoustic tone that will make listeners fall in love with you and your pieces. You also get the new SRT2 pickup system, and you will enjoy the satin mahogany neck finish and its slim taper profile, which reduces its footprint so that you can store it pretty much anywhere. When it comes to strings, it comes equipped with the Elixir NANOWEB strings, which are lighter and they help deliver a lively tone and an extended life. The Epiphone Hummingbird is a modern reiteration of the classic model with 21st-century improvements. It rocks the Shadow Nano Flex pickup system, which improves sound quality and tonality, and the new shadow performer preamp which further enhances the piece’s high-performance. It has a solid spruce top, ideal for heavy-duty tasks and aggressive guitar playing sessions, and mahogany back and sides for a touch of class. The Rosewood fingerboard with pearled parallelogram inlays preserves the famous tonality of the model and makes it easy to handle, thus great for beginners looking for something comfortable and simple. The sound booms just enough, and it’s nicely defined and not dull. The strings are tuned right off the box, so you can just take it out and start creating timeless pieces. Keeping it maintained and clean is an easy mission since it is compatible with most accessories and because all cleaning kits can be used to keep it spotless. This instrument is part of an award-winning series of guitars that offer high-quality at a reasonable price. It received rave reviews in the States and Europe, mostly due to the impressive selection of materials used for its construction and due to its stable sound and accurate notes. It offers an incredible tone and player experience, and it features a solid top, made of wood and not laminated, as some models on the market are. Each model is then further designed to get the best out of its premium components and to give emotion to any song the user is playing with its help. Some of its other components include the FST2M bracing system, the bi-level bridge, and the real bone nut. Its top is made of Sitka spruce and cedar, materials which were handpicked to offer consistent quality in all playing conditions since not all halls have the same acoustics. Another model that features a spruce top is this one from Takamine. It has laminated nato back and sides and a satin finish that will feel soft and pleasant to the touch as you’re handling the guitar. The tuning machines are chrome plated, so they will resist rusting and have that premium shine everyone loves. The sound it generates is warm, open and robust, and both the bass and the treble registers are present and balanced to each other. This guitar feels right and is exciting to play mostly because it is responsive to your commands. The fretboard is made of Rosewood, an excellent choice known for its durability. This top-selling acoustic guitar is the ideal tool for a beginner of any age since it is user-friendly and lightweight. From its appointments to the clear acoustical tones it projects, the finely crafted jewel will impress you and your audience from the first seconds you play with it. This is a well-received product that doesn’t cost a fortune. With the manufacturer focusing on great playability, an appealing musical tone and also outstanding craft quality, it is not hard to see why this original piece quickly became a classic and a favorite among professional music players, and also among newbies who want a reliable product. It has a louder and stronger sound, especially in the low to mid-ranges, thanks to its featured cutting-edge acoustic analysis technology developed by the famous Yamaha R&D Division. The engineers have achieved this sound quality by developing an innovative bracing design without compromising and depending on tradition. It is a reliable acoustic guitar for contemporary players because it has an adjustable truss rod, a Rosewood bridge, and die-cast tuners. The fingerboard is made of Rosewood as well, just like its back and sides. The top is made of solid Sitka spruce. A solid Sitka spruce top and sturdy nato back and sides – these are just some of the guitar’s specs that could be enough to convince anyone to invest in it. To that add the Rosewood bridge and fingerboard, and the die-cast tuners which are resistant to rust, so they can prolong the unit’s life. If that’s not enough for you, you should also note that it has an adjustable truss rod and that it features a new and improved scalloped bracing pattern. All of these elements bring out the natural sound of the instrument, without any distortion so you can use it for gigs. No matter what your personality is and what music style you like, the product will be able to keep up with you. It is made to be a lifelong partner, and it comes with Yamaha’s stamp of quality since it is a brand known for putting a lot of effort into creating timeless models. The beloved guitar sports the classic look of an upper-end model and a timeless tone, but without the price tag of a premium piece. It is a fine example of a successful design since it incorporates the solid Sitka spruce top and also Rosewood back and sides to deliver a tried-and-true outstanding acoustic voice for all of your recordings. Other cool features include its comfy yet solid Spanish cedar neck and its Richlite fretboard, which add durability to the craft. As a final touch, an old school tortoise-colored pickguard enhances the model’s natural gloss-finished spruce top. 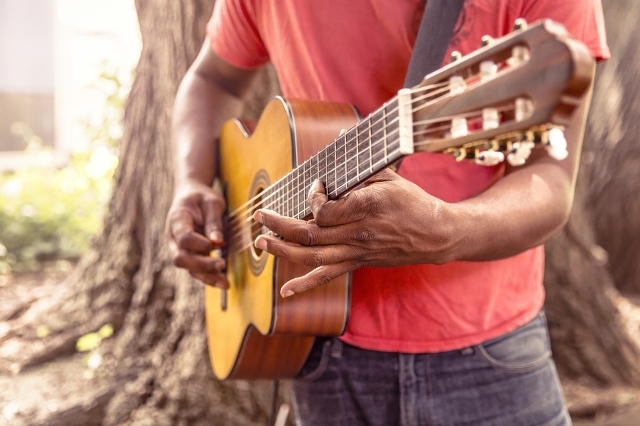 The guitar holds its tune well, and it can be used with a capo. The piece can also accommodate all types of strings, including nylon ones which are perfect for beginners. So if you’re interested in getting a high-quality guitar with no electronics and inlays, this might be the one for you. From the first chord you’ll play with its help you will fall in love with the warm and vintage sound of the guitar. It just feels great in the hands of the player with its solid rosewood back and sides, and it delivers high-performance even in demanding conditions and environments like a concert hall. You’ll also appreciate the open gear butterbean tuners, and its understated ‘T’ logo, things which appropriately accentuate the wide-open vintage tone and vibe of this beautiful instrument. It is subtle, but it won’t underperform since it also rocks the TLD-2 Line Driver preamp. To protect it from damage like scratches and shocks, the manufacturer also offers a case in the pack. Specs-wise, it rocks an ebony fingerboard, a glossy natural finish and many other elements that reveal its high-class craft. It can be your primary guitar, or a replacement if you already own one that you cannot be separated from. Choosing a new and good sounding acoustic guitar can be an exciting process. There are hundreds of great instruments out there for you to choose from, and if you follow our simple advice, the process won’t feel overwhelming at all. The best first step is to take things easy – just think about how you intend to use the piece. If you made up your mind, then look for accurate sound output, for a solid craft and features such as easy maintenance and portability. Let’s discuss what makes a quality acoustic guitar stand out in detail so you can make a decision much faster. The right tonewood depends on your personal preference, on what type of sounds you like, and how you plan to play your guitar. Guitar artisans, or luthiers, mostly believe that the wood chosen for the top part of the piece is the single most vital factor in determining what your instrument will sound like. The back, sides, and the neck are also significant in deciding the overall tonality of acoustic guitars for sale. Other elements, such as the bracing, bridge, and fretboard, can easily enhance or constrain the tonal effects in the long run. The same thing applies when it comes to the style of a quality beginner bass guitar too. Spruce is a cheap and standard material for tops, and the most used species is Sitka, due to its quality. Its high rigidity and light weight make it a natural choice when it comes to high-velocity sounds. Sitka also has a powerful direct tone capable of retaining its clarity even when played forcefully. Cedar is another popular top wood, renowned for its balanced and warm sound, best sounding acoustic guitar reviews tell us. Artisans also use mahogany to create tops, but it has a lower response rate. And an equally premium material is Rosewood, because it has a broad range of overtones, and is also characterized by strength and complexity. Choosing between an acoustic guitar, which is a simple and light creation, and a premium and cool acoustic electric guitar, which a bit more complicated, is an important decision. This is why you have to take another moment to introspect and to think about how you plan to use the guitar. The main difference between the two guitar designs is that an acoustic-electric guitar usually contains some sort of an electronic “pick up” system, so you can plug the unit into an amplifier or a more efficient PA system to hear your acoustic sound reproduced as you would listen to it if you played it from your phone. Even if you don’t want to play out live shows, there are a few benefits if you decide to choose an acoustic-electric guitar, instead of a classic one, but you might have to give up others. For example, many artists enjoy being able to plug their instrument directly into audio interfaces like powerful and clear guitar amps so that they can record their songs. This way, you can write songs fast. But these types of guitars are larger and have strings made from tougher materials. The sound output is not as warm and delicate either. Plus, because they have additional parts inside, the guitars will be heavier and harder to hold as you’re using them. However, they can work with a cheap guitar multi effects pedal. Acoustic guitars mostly come in a variety of shapes and sizes, from small to jumbo to the famous dreadnought. The form determines the amplitude of the sound projection and also the tonal emphasis. It also influences the playing comfort. Some guitar bodies come in what people call a single cutaway design and sometimes even in a double cutaway design. There are acoustic guitars that have pickups and preamplifiers built in to allow you to play them in venues where you need a boost in volume to fill the room. There are systems more complex and expensive that combine a preamplifier, a microphone, with EQ, and tuners. But this is an overkill if you are not a professional music player. When it comes to choosing the style of the neck of most well-crafted cheap acoustic guitars, it’s the size of your hand that should make the difference. Generally, the width of the neck and its thickness is based on the measurements of the body of the instrument and on how many frets the neck has. The last element that is part of the style category is intonation. It determines whether or not the notes you generate are in tune as you move up and down the fretboard. If the real distance between the frets is off, the guitar you pick will be incapable of playing in tune. Thus, it will be useless as a recording tool and even as a performance instrument. The type of tuning machine your model has is very significant. This is what allows the user to fine-tune and hold pitch as he or she is performing. Enclosed machine models resist rust and other corrosives, and therefore don’t need as much maintenance or replacement as open tuning tools. If it doesn’t come with an inbuilt one, you can always buy one from the Internet. Furthermore, the materials used for the bridge and the fingerboard affect the sound too, but this is somewhat minimal compared to the body of the piece. You should also see if the piece can connect to an external energy-efficient guitar tuner, for more versatility. Different types of finishes can indeed affect the way the wood of the guitar vibrates, but unfortunately, there is nothing you can do to change that. The guitar manufacturer makes these decisions, but at least you can trust that it usually chooses wisely. Also, it might be a good idea to invest in diverse and colorful acoustic guitar pickups, as you will need plenty of those.